Folding cartons with snap lock bases are a special form of folding box with reverse tuck ends. While in this type of folding box the lid is also closed with a tuck-in flap, the insert flaps on the bottom of the folding box with the insert bottom interlock during erection and thus form a firm closure, even without glue. This box complies with the ECMA Standard A5520 B/ A55.20.01.01. 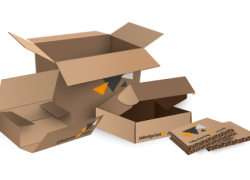 In industrial packaging, folding boxes with snap lock bottoms or 1-2-3 bottoms are mainly used to surround heavy objects with secondary packaging. All six sides offer space for information and advertising. Typical applications include cases for glass bottles, printer paper, beverage cans, or heavy computer accessories. 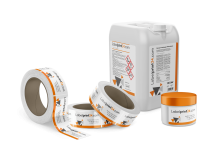 Whenever a "normal" tuck-in flap does not close the base firmly enough and the product could slip through it, folding cartons with snap lock bottoms are the better and cheaper alternative. The folding box with snap lock bottoms also fulfils several functions simultaneously for the product inside it. It protects the contents from external influences such as dust, moisture, light, or scratches. It serves as transport packaging and ensures that the products can be easily stacked and presented on the shelves. The surface can contain information and advertising or hold secondary packaging, such as labels. 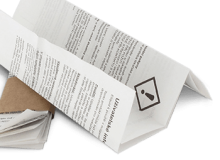 Folding cartons and their contents almost always form a product unit and consumers perceive them as such.